Commemorative Edition digital HD releases. Commemorative Edition Blu-ray and DVD releases. This section of the DCAU Resource is dedicated to the Wonder Woman Direct to Video Movie. On the mystical island of Themyscira, a proud and fierce warrior race of Amazons have raised a daughter of untold beauty, grace and strength-Princess Diana. When an Army fighter pilot, Steve Trevor, crash-lands on the island, the rebellious and headstrong Diana defies Amazonian law by accompanying Trevor back to civilization. Meanwhile, Ares [the god of War] has escaped his imprisonment at the hands of the Amazonians and has decided to exact his revenge. Ares intends to start a world war that will not only last centuries - but wipe out every living being on the planet, starting with the Amazons! It is up to Princess Diana to save her people and the world, by using her gifts and becoming the ultimate Wonder Woman! 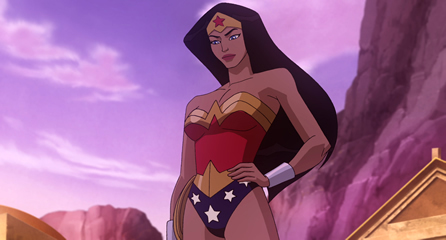 WONDER WOMAN stars in this next installment of the DC UNIVERSE series of original animated movies! DCAUResource.com is an unofficial website. Wonder Woman, Ares, Steve Trevor and all other related characters and indicia are copyright DC Comics, a division of Time Warner.